Sometimes family relations are not the picture of peace and tranquility that we wish they were. Sometimes it can be downright ugly and people can wind up hurt. So what can one do under such circumstances? Go to the hills. More specifically to the mountain. 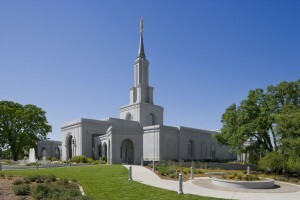 The prophet Isaiah saw the coming of the latter-day temples when he wrote about the Mountain of the Lord being established in the tops of the mountains. Indeed when one looks at the Salt Lake temple one can see the prophecy of Isaiah fulfilled. Yet there is more than one Mountain of the Lord. As a matter of fact, the last time I checked there were 133 of them scattered throughout the world. I had such an occasion earlier tonight. Somehow I knew things were going to be bad even early in the day before it hit the fan. I had this very uncomfortable tight feeling in the pit of my stomach that would not let up and prevented me from eating much of anything all day. I guess I should have gotten a clue. When things went from bad to worse it was after midnight and it prevented me from sleeping. After crying a bit and feeling really hurt, I got in the car and started driving. I kept trying to put the voice out of my head that was urging me onward toward the temple, but it wouldn’t go away. After all, it was well after midnight and logic told me that there was no point in going there. The beautiful lighting that illuminates the temple at night goes off at midnight, and the gates to the drive way of the temple were locked. Never the less I continued driving. Somehow there was a divine purpose in this late night drive. When I got there, the approach to the temple was locked and the lights were off. The statue of Moroni was about the only thing visible. Unless one knew what it was, it wouldn’t have even made an impression. So was this a late night wild goose chase? No. There was a reason in my going there as I did feel the peace and security that I longed for. I felt and heard the familiar whisperings of the spirit and the voice of comfort. As painful as the previous part of the day had been, I felt comforted. I was reminded of other occasions when I had sought comfort within the shadows of the Mountain of the Lord. Whether the break-up of a relationship, the loss of a friend, or any number of other reasons I’ve been blessed by going to the temple; even when it was closed. I go to the hills, when my heart is lonely. The comfort that comes from the temple is real and as a beloved friend pointed out to me the reason that it is such a comfort is because the focus of the temple is on what is really important. The problems of life and the pain some family members cause is still there. But the temple and the spirit of the Lord which emanates from its very walls, brings peace and comfort to the heart and enables the heart to continue singing. Posted by Eric Chaffey under Family,Issues,Personal. Eric, it’s easy to fall into the idea that it’s the external trappings of the temple that are the evidence of its sacredness–the lights, the beauty of the building, the well-tended grounds, but you’ve shown that it is the Spirit dwelling there and the meaning planted in our hearts that make it special. Thanks. Thanks for the email, erik. It reminded me of times when I went to the Oakland temple. Though I never got to go inside just being there was special. It was weird, because there is so much commotion with the freeways and sprawl all around you, but yet so peaceful once you walk onto the temple grounds. This is an impsiring story. As I was reading it a family member was actually making me upset. God knows exactly what to put in your face at the right time.